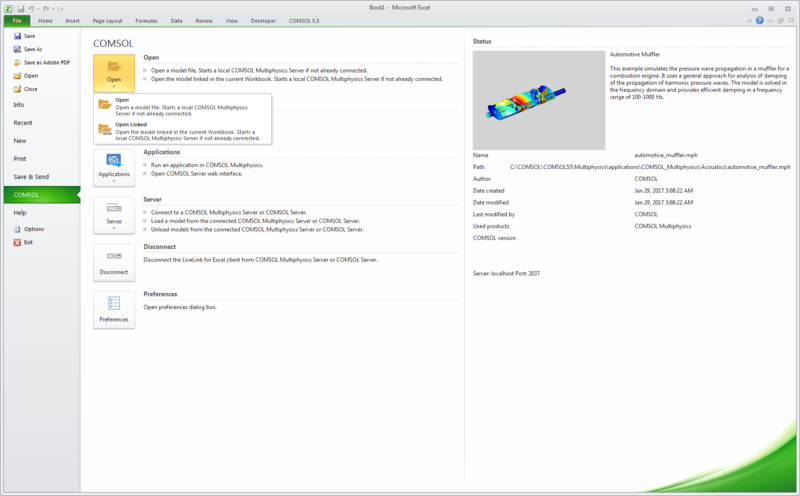 For users of LiveLink™ for Excel®, COMSOL Multiphysics® software version 5.3 brings usability improvements. Browse all of the LiveLink™ for Excel® updates below. Several buttons that were previously contained in the COMSOL tab in the Excel® spreadsheet software ribbon and that relate to loading and saving COMSOL Multiphysics® models and handling connections to servers have been moved to the File menu. 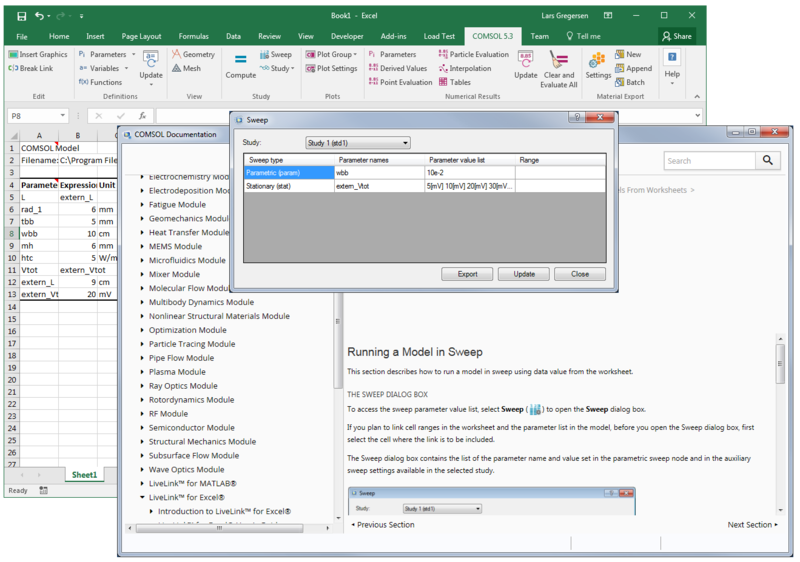 This leaves more space in the COMSOL tab in the ribbon for functionality related to working with the COMSOL Multiphysics® models in the Excel® workbook. LiveLink™ for Excel® has a new appearance for buttons that load or save models and for handling connections to servers. LiveLink™ for Excel® has a new appearance for buttons that load or save models and for handling connections to servers. For faster access to the documentation, all windows and dialog boxes now have direct access to context-sensitive help. It is now much easier to get help for some of the more complex settings by clicking on the Help icons in the Excel® ribbon or dialog boxes. Two new buttons have been added to the Numerical Results group in the COMSOL ribbon tab in the Excel® spreadsheet software. The Parameters button provides access to parameters defined in the Parameters node in the Results section of the COMSOL Multiphysics® model tree. Additionally, the Clear and Evaluate All button will first clear all table entries and then evaluate all derived values and insert the new values into appropriate tables. Microsoft and Excel are either registered trademarks or trademarks of Microsoft Corporation in the United States and/or other countries. COMSOL AB and its subsidiaries and products are not affiliated with, endorsed by, sponsored by, or supported by these trademark owners.